"Galaxy" won a blue ribbon this weekend in the South Mississippi Art Association 34th Annual Show in Hattiesburg. The wall quilt is 37" wide and 24" high. The blue-to-green ribbon is pieced with hand-dyes by Mary Nell Magee, and the orange ribbon and lighter blue ribbon are Martha's own hand-dyes. It incorporates Caryl Bryer Fallert's gradated fabric for the background. The outer border is a commercial batik. Quilting in the background matched the colors in order to de-emphasize the background and call attention to the three ribbons. The piece was designed in a class with Caryl Bryer Fallert at her studio in Paducah, Ky., in the fall of 2009, and extended and completed in 2010. I gathered this variety of leaves in our yard. Some of the trees belong to neighbors but the wind brought them for me to enjoy. Yesterday they were lightly covered in mist and they dried on the platter in the center of our table. South Mississippi is a riot of color--yellows, oranges, reds, and every shade in between. Our crepe myrtles had green leaves just two weeks ago--see them in the picture of the tall red tree. Today they are brilliant yellows and reds. The nandina bushes are heavy with red berries, just ready to bring into the house for holiday decorations. Of course, we have pine cones available all year, with a thick carpet of pine needles on the grass--which needs to be raked into the azalea beds to serve as mulch over the winter. "Gondola" (16 x 16) was donated to the Lauren Rogers Museum of Art's 2010 annual Gala, The Azure Ball, A Grecian Island Fantasy. The preview party will take place at the Museum on Thursday, December 2. Becky Wolsk from Washington, DC, asked to interview and profile me on her new blog about her three favorite interests: quilting, writing, and cookbooking. 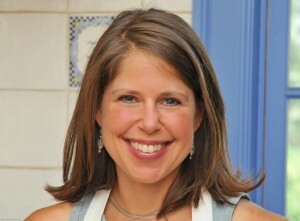 Becky has published two books (Food and Worry, and Six Words), which can be found on Amazon. I am honored to be selected for her first profile! You can find it here: http://www.textislepatchworkblog.com/2010/11/profile-martha-ginn-2. The AIDS Services Coalition held its 2010 Gala Sunday night, October 3 at the Historic Hattiesburg Train Depot. There was lots of good food furnished by local restaurants, silent and live auctions of artwork, merchandise, vacation packages, and other items. My contribution is pictured above, entitled Ribbons 2010, to fit into the event's theme of Ribbons of Change. The black/white band typifies narrow and close-minded thinking; the flying geese band typifies a gradual lifting of old prejudices and attitudes, while the bright yellow/orange band of triangles illustrates a moving forward with cooperation and hope in the fight against hatred and injustice. In 2002 I was presented with 18 beautiful applique blocks in the Baltimore Album style. These were made by all the presidents and several other founding members of Mississippi Quilt Association in appreciation for my contributions to the organization from its inception and organization in 1991, through its documentation and publication of the book Mississippi Quilts written by Mary Elizabeth Johnson. At this time I was stepping down from my role as newsletter editor to pursue more of my personal goals and to take care of family health issues. Over the next eight years, I made two more blocks, assembled the blocks, appliqued a double dogtooth border, and got it ready for quilting. My options did not include hand quilting it myself but I sincerely wanted to complete it on my own. I had recently purchased a Handy Quilter 16 and had done a couple of small quilts on it, which gave me the courage to attempt this big project. Good friends Diann Loper and Susie Jackson, both talented longarm quilters, gave me advice and encouragement, and I began quilting around all the applique elements and adding feather designs in the open spaces. Susie helped me draw an undulating feather design in the border, and I completed the quilting. I added an ecru piping just inside the binding to complete the project. Working on the quilt gave me many happy memories of our early days of MQA and our search project and the lasting friendships that were formed. I am deeply honored by this gift and dedicate it to all the talented Mississippi quilters who have enriched my life. Below is a listing of the makers of the blocks. Astericks mark the four who have passed away. 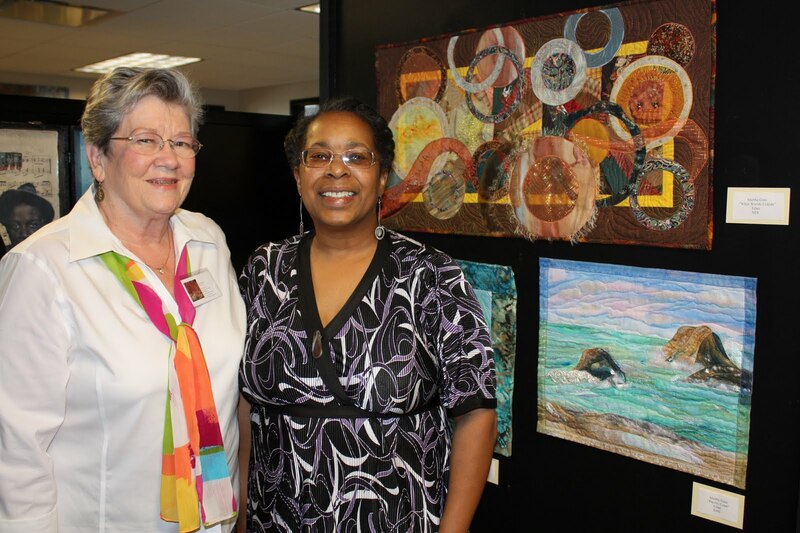 Our Pine Belt Quilters 13th Biennial Fiber Art & Quilt Show was a beautiful event. We displayed nearly 400 quilts and one of the Hoffman Challenge traveling exhibits. We awarded $6,900 in cash prizes plus three sewing machines and three other gifts from merchants. We had 21 vendors with fabric and machines to tempt everyone. Special guest lecturers were Julia Graber, Barbara Cline, and Polly Yoder, three Mennonite sisters who shared their talents and special family stories with us. You can see their individual blogs; they have also created a joint blog, which you can see here. I presented a lecture called "Lagniappe" at the show, featuring my fiber art which demonstrates my journey from my traditional background into innovative methods and original designs. I won three blue ribbons and an Honorable Mention. "Pacific Coast" (18 x 15) is pictured above. It features hand painted fabric, Angelina fibers, painted cellophane, and stitching to create the water and beach scene. The edges are finished with organza ribbon. Photographs I took on the Washington and Oregon coastlines several years ago became the inspiration for this piece. Mary Nell Magee and I collaborated on the above piece, "Cabin in the Woods III" (50 x 50). Yes, this is the third cabin piece we have made. The first went to an adoption agency auction in 2002, the second won a blue ribbon in 2003 and hangs on my wall, and this one will be hers. It is primarily made of batiks. The above piece, "100 Years of Trains," won first place in the Hattiesburg Depot Challenge. Our depot is celebrating 100 years of continuous use as a depot, and our show featured a challenge to commemorate this event. The depot has been remodeled into a beautiful building that is the perfect setting for weddings, receptions, and other special events, as well as still being used as a passenger station. I cut many types of trains from fabric and fused and stitched them onto the pieced background. Gray tulle was used to simulate the smoke. The piece is 24" square. My "Giant Wave" (below, 21" x 17") won an Honorable Mention. It contains many of the same techniques as Pacific Coast that I learned from Linda Schmidt. She is well known for her use of unusual products to achieve a desired effect. Pictures during the week of the show can be seen in the October 2010 entries on the Pine Belt Quilters Blog. 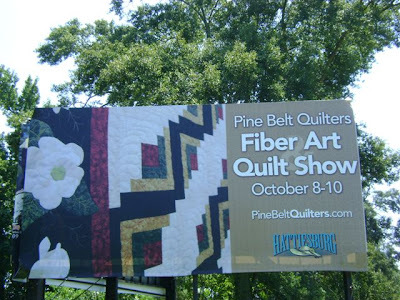 Pine Belt Quilters are excited about our 13th Biennial Fiber Art & Quilt Show October 8-9-10, 2010, at Lake Terrace Convention Center in Hattiesburg, Mississippi. We will have 400 quilts in the judged show, a special display of the Hoffman Challenge, lectures, demos, special exhibits, and 21 vendors. Kathy Kansier, an AQS certified appraiser from Ozark, MO, will be at the show to appraise new and vintage quilts for quilt owners. (Set up an appointment by calling Martha Ginn 601-264-6884; or emailing marthaginn@bellsouth.net) Kathy will also present a lecture at noon on Saturday entitled "Color and Design for Quiltmakers." Another special feature at the show will be a lecture/trunk show: "Quiltings of Three Mennonite Sisters." The sisters are Julia Graber, Barbara Cline, and Polly Yoder. Barbara is the author of Star Struck Quilts, published by C&T Publishing. The sisters will speak on Friday night and repeat again on Saturday afternoon. I will present a "Lagniappe" program Saturday evening at 6:00, showing some fiber art pieces that I enjoy making. On August 26 a Closing Reception was held for the artists whose works were was displayed in the MAC office during July and August. It was an honor to have my work displayed with these other talented Mississipi artists. Below is Kat Fitzpatrick (on left) with her dynamic encaustic work. Kat explained encaustic to those of us who were only familiar with the word but not the process. My three works displayed were (top) When Worlds Collide, Giant Wave, and Pacific Coast. I said head-high vines! The harvest is finally coming in, picking 20-25 tomatoes each day. This variety is about golf ball to tennis ball size, very tasty. Roy is so proud and has given some to everyone who has been at our house all during the month of August. Finally, about August 1st we began to get ripe tomatoes! The vines are head-high and loaded with green ones. The penta and coleus loved the Mississippi heat but required lots of water to survive. My camera lens clouded over when I came outside because of the sudden temperature change, giving a misty appearance where there was bright sunshine. The blue daze were covered in little new blooms every morning, which closed up midday. We planted several varieties of tomatoes, which grew more than head-high before finally rewarding us with a bumper crop of golf-ball-size tomatoes. While eagerly waiting for ripe ones, we enjoyed some fried green tomatoes, a Southern favorite. I love herbs almost as much as flowers, not so much for cooking as to just walk past and enjoy the fragrance. Here is my flowerbed near the driveway and garage that I walk past every time I enter or leave. From the left are a giant rosemary bush, variegated thyme, basil, parsley. Near the rosemary the light-colored plant is curry (ornamental, not for cooking) that has a delightful scent. In the front on the right are Blue Daze (evolvulus glomerata), trailing vinca, penta, coleus, and Diamond Frost (Euphorbia). The clay pot holds an interesting blue star-shaped flower that is as beautiful as the Blue Daze (lost its name), and the white pot contains a prolific invasive weed that rewards me with green and white variegated leaves. This is one happy rosemary bush! I never harvest my parsley but let it grow as much as it will, hoping that a caterpillar will discover it and eat her fill and then form a chrysallis when she is ready. These make beautiful black swallowtail butterflies if the birds don't have a feast first. I try to watch for the chrysallis stage and give some protection with netting. I have even been lucky enough to see the butterfly emerge and stretch her wings before flying off. This takes more patience than I think I have nowadays, but I can try. Variegated thyme. I am hoping it will thrive and trail down over the stones. The basil makes a nice little bouquet when the tops need to be pinched off. It is a cheery addition to the kitchen window. My fiber art is on exhibit in the main hallway of the Hattiesburg Country Club during April, May and June of 2010. The Pieces of the Past series features 8 x 10 and 11 x 14 matted and framed sections of a crazy quilt made circa 1900. I bought the quilt because of its beauty, but it had too many worn-through and problem areas to use in its whole form. After much thought, I elected to cut the good sections out and frame them under glass so that they could be enjoyed. Even the threadbare sections are beautiful, and where necessary I secured the fragile areas with black tulle to hold the delicate bits of thread and fabric in place. This quilt had more embroidered stitches on it than any other I had seen. Thread Lily and Mississippi Magnolias are done with "thread-painting"--in other words, I used thread instead of paint to create the flowers. Return of the Trees is my tribute to the regrowth of trees after Hurricane Katrina's devastation in 2005. Angel Trumpet is painted on white silk and then stitched with polyester and rayon threads and framed under glass. Where does the time go? After a very cold winter (with even one snow day in South Mississippi), we are blessed with a riot of color as the azaleas, amaryllis, geraniums, and hydrangeas are blooming, just ahead of the yellow/orange daylilies. My yellow Lady Banksia rose put on another fantastic show with its profusion of tiny flowers again this spring, but I missed getting a photograph. These pictures will be great inspiration for my fiber art. 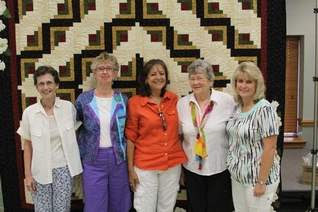 Little did I know back in October of 1984 when Doris Aultman, Susan Kelley, Gail Rowland, and I formed Pine Belt Quilters that the guild would be so large and vital 25 years later. Our beginning membership of 25 has grown to nearly 200 and has led to some of the best friendships and memories of my life. To celebrate this milestone, the guild issued an anniversary challenge to create a wall quilt (min/max 24"-30"). Nine members created a variety of clever pieces, with Jo-Ann Evans winning the challenge (see PBQ's blog entry of November 2009). PBQ means so many things to me that I could not limit myself to one event or image, so I created a collage or album of photos scanned onto fabric and applied to the background. It contains our membership directory covers, photos from early retreats, shows, and activities. I quilted it on my new Handy Quilter 16. It was fun going back through our interesting history to gather reminders of learning, sharing, and fellowshipping. Pacific Coast is my rendition of a scene I photographed on a trip to Washington State in 2004. The piece is 18" wide x 15" high and finished with organza ribbon on the edges and features several techniques I learned from Linda Schmidt. Beginning with a solid piece of Kona cotton, I painted the sky with blues and pinks and pearl white paints and placed it in the background. The water and sand were painted in several shades of blue/green and tan and then cut apart and restitched in layers. I cut the rocks from a Mickey Lawler Skydyes fabric. Angelina fibers, painted and melted cellophane and organza were added to create ocean foam and spray. How exciting it is to see one's artwork in print and be able to share this news with friends and family. Events like this also give us a chance to think deeply about what we do and why we do it and put those thoughts into words. Our creative endeavors are essential to our emotional wellbeing, and having the fruits of our labors printed so colorfully--well, it is just too rewarding for words!